IF his mayoral rivals can be optimistic and make all sorts of assertions, so can he. Mayoral hopeful Felix Borres yesterday laughed off former Agriculture undersecretary Jose Gabriel La Viña’s forecast of an election victory against reelectionist Mayor Oscar Moreno even as he predicted that he would stun his opponents and pull off one of the biggest upsets in the history of Cagayan de Oro politics. Borres, one of Moreno’s challengers, said La Viña erred in predicting that he (La Viña) would win in the mayoral race. Borres said that based on his reading of the political developments in the city, everything is happening in his favor and that the race for the mayoral post is going to be between him and Moreno. He said that if there is anyone who can unseat the sitting mayor this year, it’s going to be him. He said La Viña is unwittingly doing all the offensives against Moreno for him, and at the rate the mayor is being attacked, he (Borres) is optimistic that he would emerge as the winner in May. “Ako nang nakita sa unahan,” said Borres of what he said as his impending victory in this year’s mayoral race. He said the public awareness level about his candidacy is high after his three attempts to win in the city’s mayoral elections. Borres said he has always maintained a decent campaign and has never engaged in mudslinging unlike his political opponents, and many voters have seen that now. “Ang akong tambag nila (Moreno and La Viña), mangundang nalang sila. Dili na lang sila mangdagan kay mga sison naman na sila kaayo. Mas maayo pag maghilom na lang sila,” said Borris. Asked to cite examples, Borres took credit for helping in solving a recent power crisis that gripped the city. He said he was instrumental in bringing in investors that increased the power-generating capacity of this part of Mindanao without using public funds. “Kaniadto mora baya ug tingog sa pump boat ang imong mabati diha sa Divisoria tungod sa mga generator. Nasulbad nato na kay daghan mang power industry investors nga atong na-imbitar,” Borres said. Like Borres, another mayoral hopeful, Benjamin Contreras, frowned over what he called as political intramurals between the groups of Moreno and La Viña. Contreras said the warring political groups have been engaged in mudslingings in their respective efforts to win the city’s mayoral and other city hall posts. He said the politicians should bring their campaigns to a higher level and not engage in below-the-belt attacks. “Para kanako, wala ko mo-angay anang ilang pagbinatohay ug lapok. Dili ko gusto motampo ana kay ang ako man gud, gusto nako nga dad-on ang atong election to a higher level, nga naay gamay nga decency ba,” said Contreras. Contreras gave his unsolicited advice to Moreno and La Viña: stop the mudslingings. “Dili man siguro kinahanglan ang ingon ana. 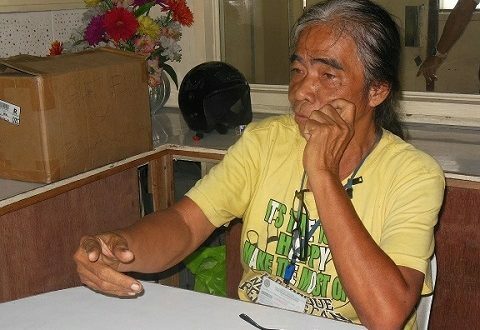 Total makita man sa katawhan ang kinsay angayan molingkod,” he said.